Our Early Years Foundation Stage Unit is separate to the main school building. Within the unit we have two classrooms, one for our F1 part time children (3 and 4 year olds) and one classroom for our F2 children (4 and 5 year olds), which is where full time school begins at Athersley South. Although F1 and F2 have separate classrooms we come together and share the amazing space outside during our outdoor learning. Please use this page to find out all about how our children's interests have been extended and built upon each day by the staff, our newest posts will be at the top of our web page. We will also provide useful links to help support your child's learning at home. We have been working really hard with our talk for writing. Today we did our final write but we added a twist... we changed the characters! 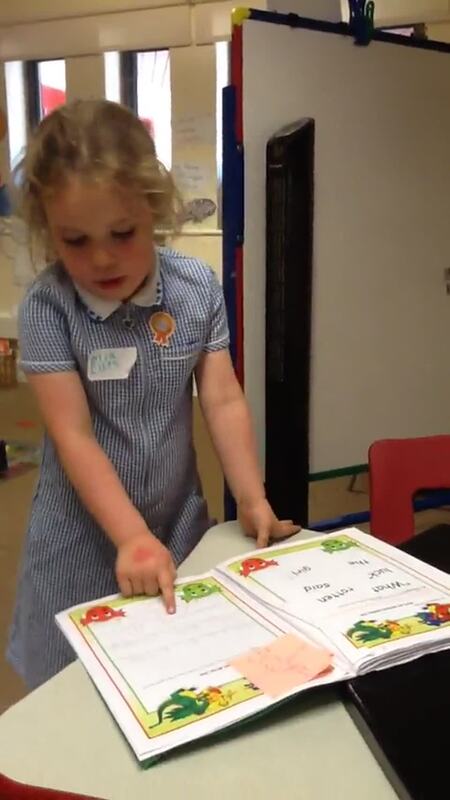 Have a listen to this lovely story made by one of our children. The children have loved making apple pies in our mud kitchen, they have been talking about the ingredients and the method to making an apple pie. Today the children made a real apple crumble with Ms Ward, they helped chop the apples and spread the crumble all over. It looked delicious! "I cut the apples in to little pieces so we don't choke"
"Its so soft and fluffy"
"Its going to be yummy"
"The crumble part tastes like biscuits"
The children enjoyed exploring the paints outdoors and they also came up with the idea to create leaf prints, but we had one problem...we had too many children and not enough paintbrushes. The children thought really hard about what we could do, we tried waiting but it was taking too long, we tried taking it in turns but that didn't work either. One of the children had an idea "lets make some with sticks". The children collected sticks but they didn't paint very well. Another child said "I know lets but grass on the ends like a paint brush", and that is what we did. We collected different textures such as lavender stems, grass and leaves and the children loved exploring the different scents from the natural materials and marks they made. Take a look at our super work for our Supertato Talk for Writing. We have created story maps, key vocabulary lists, sentences and had a try at writing our very own story. The children have worked really hard and we cannot wait to see how well they do with our next story 'Zog'. Take a look at how good we have got at retelling the story of 'Supertato'. We have learnt lots of actions to help us. Our next challenge is to make our own Supertato stories, make sure you come back to see our amazing writing. In both F1 and F2 we have been exploring the story 'Supertato' for our talk for writing. The children have really enjoyed this story and it has prompted lots of different learning opportunities both inside and out. Outside some children pretended to be the evil pea and trap all the vegetables, while other children pretended to be Supertato and save the day. The Supertatos had to use their super balancing and co-ordination skills to beat the evil peas and save the day! In F1 we have been learning about Chinese New Year. We learnt that their are 12 animals of the Chinese zodiac and 2018 is The Year of the Dog. During the Chinese celebrations little red envelopes with money in are given to children, which fetches them good luck throughout the coming year. We tasted some yummy Chinese food and used our scissor skills to make Chinese lanterns. During the half term many people around the world celebrated the Chinese New Year on the 16th February. This week we have been exploring how lots of people celebrate this occasion and how it is similar or different to how we celebrate. Today we had a special treat, this morning we looked at different things from China such as newspapers, fans, hats and clothing. We then chopped lots of different vegetables to help make a stir fry with Mrs Brown, ready for this afternoon. Mrs Brown and the children made rice, rice noodles, stir fry and we also tried prawn crackers and spring rolls. We were all really proud of the children trying the different foods and it was lovely to hear the children talk about the different foods they have at home and enjoy with their families. Before the half term we were very lucky to have Team Activ come to our school and teach us dance. 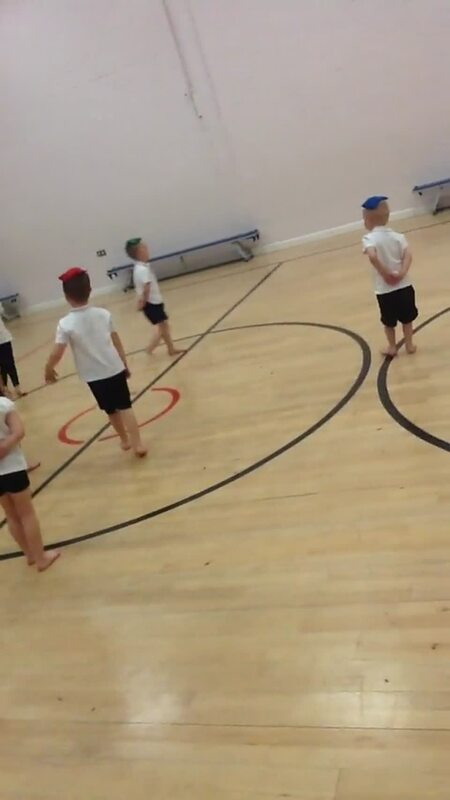 The children really enjoyed it and we learned about moving in different ways and making a routine. This half term the children are really excited about having Mr Gorner back. 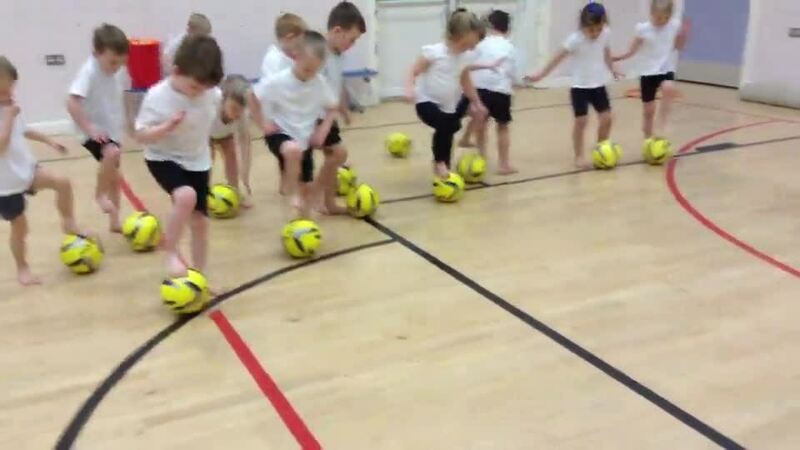 Today, after our warm up we found out that we will be learning ball skills and moving like a footballer. 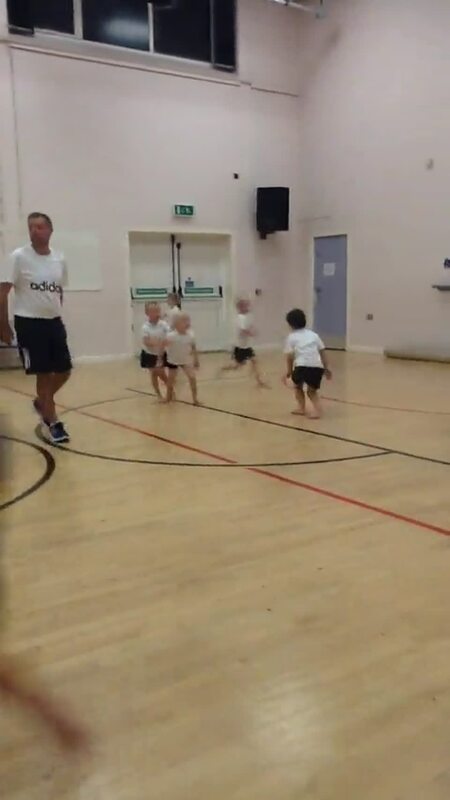 The grown ups were very proud of the children listening to instructions and trying really hard to 'dribble' their football. Can we please remind parents that PE is every Wednesday and children need to bring their PE kits (black shorts and a white top) and make sure earrings are taken out. These children have been working really hard this morning on the computer. 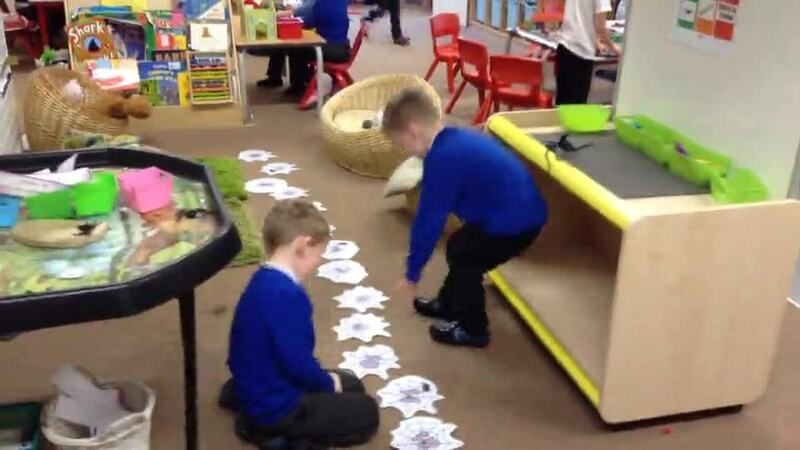 They selected a game and worked together to take turns and solve the number sentences all by themselves. We would just like to say a big thank you to all the parents and carers in F2 who have let their children bring in their wows from home. We really do love learning out about what everyone gets up to outside of school and our display in our cloakroom is looking great! Your child's wows can be anything from a certificate, medal or even amazing things they have done for you at home. We look forward hearing, seeing and talking about all the amazing things our class gets up to outside of school. Today these children have been really busy with our spider numbers in our continuous provision. They shared out the numbers between them and worked together to put them in the right order from zero to twenty. The children noticed there was a number missing.... number nineteen. They looked every where for it but it could not be found. Then they had an idea, they drew a spider web and wrote '19' and added it to the right place... problem solved! Miss Pell played a little trick on the children by moving the numbers around but she could not trick them out, they were really good at spotting the numbers that were not in the right order. The children then continued the number line all the way up to 43. The F1 children had a fantastic party day. They enjoyed playing pass the parcel, musical bumps and pin the nose on the snowman, as well as eating lot's of yummy party food. 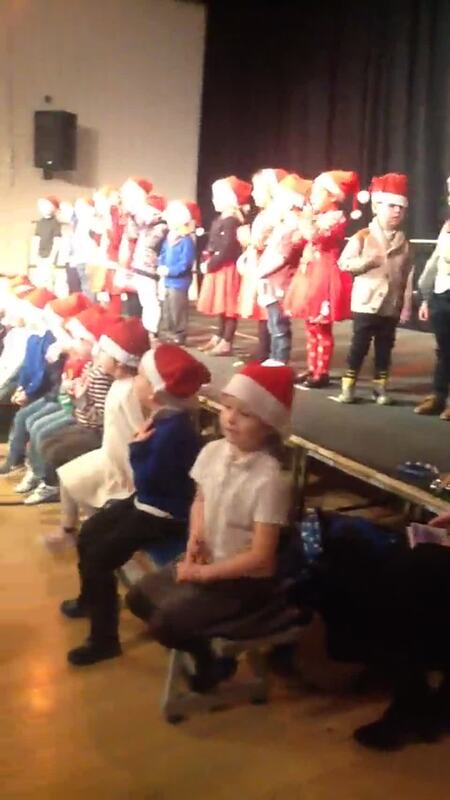 A big thank you to all the parents/carers that came today to watch our fantastic Christmas singing. We hope you enjoyed it! 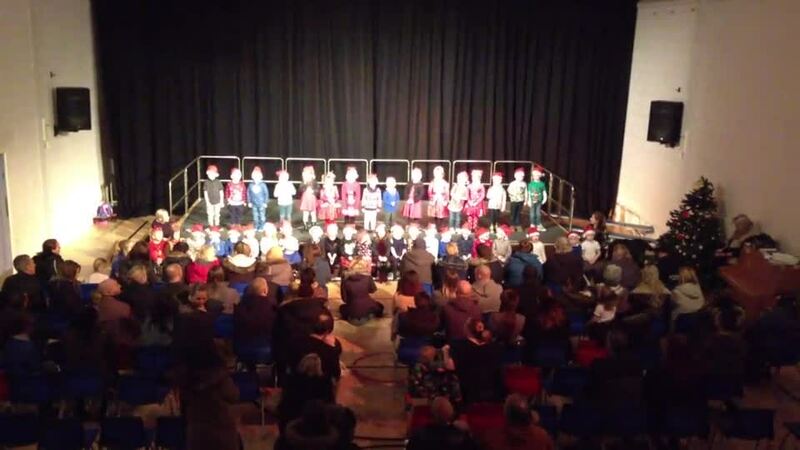 We would also like to say a big well done to all the children today, they were all very sensible throughout our concert and sang beautifully. 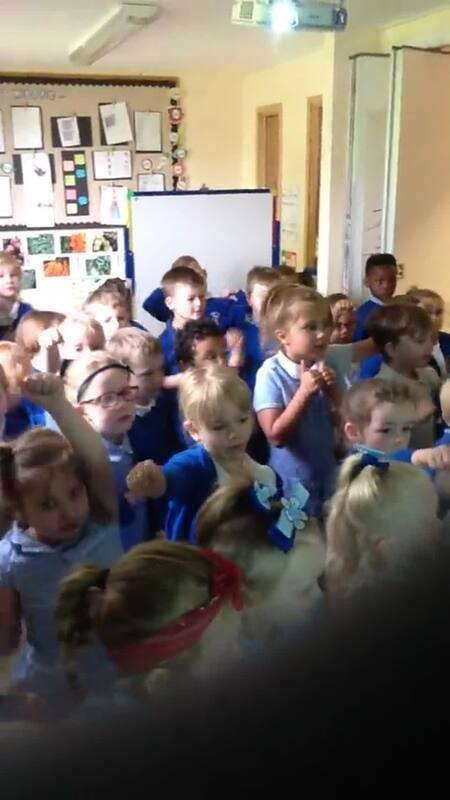 Here are a few of our songs and us having lots of fun at our party this afternoon. Look at this fantastic work! Miss Pell tried tricking me out by giving me different words and I had to find the right letter sounds to make the word. I also did some word building to make captions. Today in Miss Pell's Big Maths session we played bowling to help develop our counting skills, matching quantity to number and recording our marks. The children in the group loved it so much we continued to play the game within our provision with lots of other children. With a bit of masking tape we had made our very own bowling alley! F2 have had lots of fun outside in the water area. 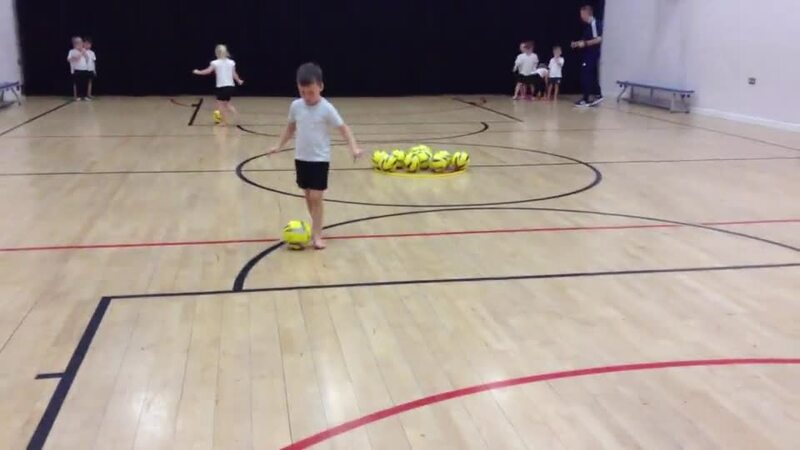 Today Miss Pell gave us a challenge using buckets and balls. Miss Pell put plastic balls in the bottom of the empty bucket and our challenge was to get the balls out of the bucket....without touching the balls or the bucket! We did lots of thinking and then we came up with an idea to try and fill the bucket with water. We worked together to find containers to pour water in to the bucket and it worked. "The water pushes the balls up to the top"
We had to use lots of water we guessed that we would need 5 buckets of water but it turned out we needed more. In Big Maths we have been learning about different measures. Miss Pell measured the children in her Big Maths group to find who was the tallest and shortest. In our group we found that Bobby Bear was the shortest and Miss Pell was the tallest! After our Big Maths session we were really interested in measuring each other and extended our understanding of tall and short. Today the children came to school in non-uniform or PJ's to raise money for a really special cause. We had a special treat at the end of the day... a PJ party with nibbles and a DVD. Do we look cosy? Thank you to all of the parents and carers who donated. Thank you to all of the parents/carers that attended our reading morning/afternoon. If you would like any more information about Read Write Inc, please see a member of staff or click on the link below. This week we have had lots of fun outside developing our imaginations, being creative and applying our phonic knowledge when making potions, lotions and wands. At the end of the week we had our Halloween disco where we dressed up, played games and ate lots of terrifying treats! Miss Pell brought some pumpkins in for us to explore. We really enjoyed emptying the pumpkin (it was very gooey) and drawing faces on it for Miss Pell to carve. We also decorated the pumpkins with different media with Mrs Brown. Our favourite pumpkin activity was hammering golf tees into the pumpkin with a rubber mallet. Miss Pell made sure we used it safely! As well as developing our hand eye co-ordination and understanding of using tools safety we practiced our counting skills by rolling a dice and counting out the same amount of golf tees. The F1 children have enjoyed exploring and playing together outside in all weathers. Mrs Sung's and the children's green fingers! Mrs Sung and the children were exploring in our garden area today and they found something hiding under some huge leaves.... courgettes. The children helped pick the courgettes and put them all together, we had lots of different shapes and sizes. Mrs Sung had an amazing idea of chopping them up and roasting them in the oven, then after dinner we can all have a try. The children were very excited to help. After a big talk on using knives the children helped wash and chop the courgettes up ready to be put in the oven. In the afternoon we tasted the roasted courgettes and some children found them really tasty but not everyone liked the taste or texture. All the grown ups were really proud of the children having a try at tasting our own grown courgettes. We had some courgette pieces left over so we did some beautiful printing and pattern making with them. Today all of the children took part in a local walk along Wakefield Road towards New Lodge Shops. We did lots of talking about our local area, different buildings and signs we could see along the way. The children also shared their own experiences about where they live and what they do at home. The children listened and walked very sensibly outside of school and all the grown ups were very proud of them. As a treat Miss Pell, Mrs Sung and some children went to the Co-op to buy some sweeties for everyone to take home with them. The children picked the sweets and we had to use our counting skills to make sure we had enough for everyone! This week in Big Maths the F2 children have been looking and exploring 2D shapes. Take a look at some of our amazing shape models the children have created. We have a mixture of houses, a frog, a sunshine. rockets, monsters and a person holding a ball and a sword. The children tried really hard to think about the shapes they needed to make their creation. Well done F2! This afternoon the rain had started but that did not stop us from exploring outside. The children tried really had to put their own wetsuit and wellies on and also helped their friends to be ready for the outdoors. 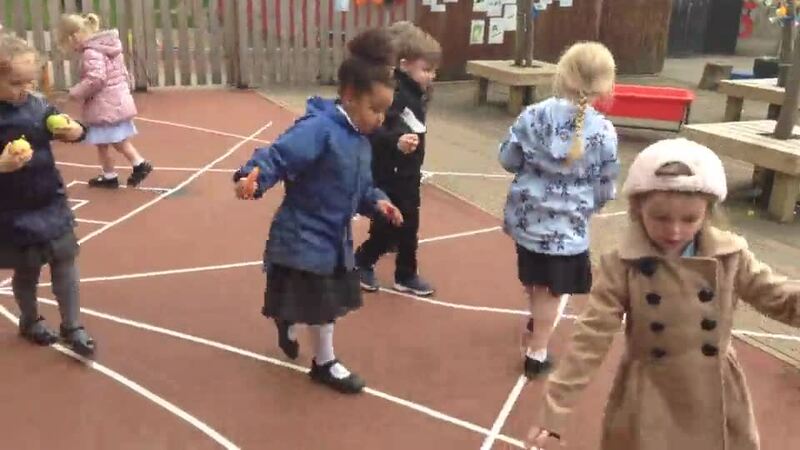 The children had noticed that the rain had made some puddles on the floor. The puddles were not big enough for everyone to jump in so the children decided to make their own puddles and also work together to make one really big puddle. The children loved moving the water around using different resources and working together to solve problems. Our favourite ways of moving the water were jumping and using the sweeping brushes, to help show the water moving Miss Pell added some washing up liquid. The children quickly found out that if they jump really fast the washing up liquid would make more bubbles in the water. They also found out that pouring more soapy water in the same space would also make a big, bubbly puddle. The F1 children loved joining in too. 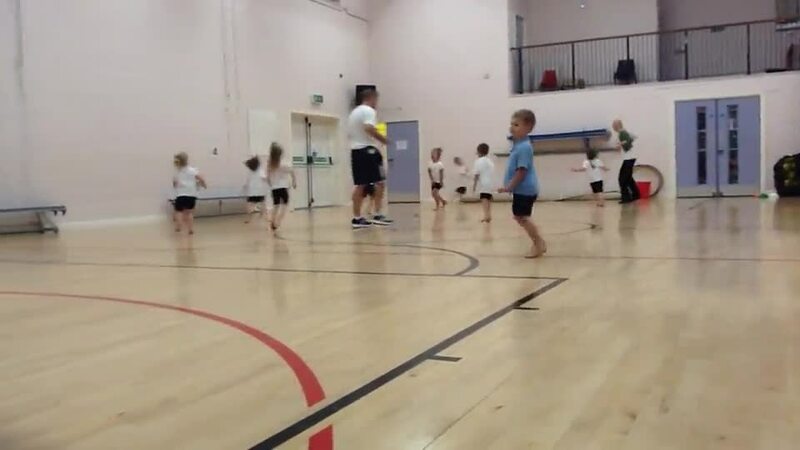 The children love doing PE with Mr Gorner. 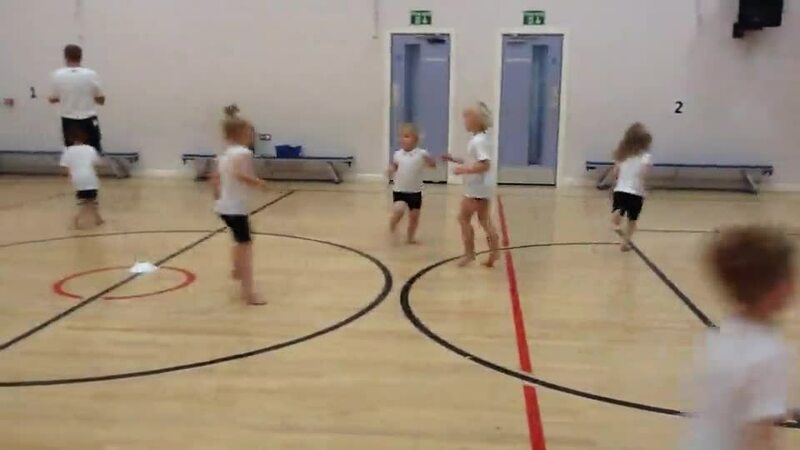 Throughout the year the children will take part in PE sessions every Wednesday and will develop and build on various gross motor skills, balance and co-ordination. This week we have be learning about different ways of travelling and also building on our balancing skills. We have two separate PE sessions on a Wednesday with Mr Gorner. Miss Walsh and Miss Ward/Mrs Sung's key group will go first and then Miss Pell and Mrs Brown's key group will have the second slot. Please remember your child's PE kit for these days and that earrings must not be worn on PE days. The children had collected lots of apples from our tree outside so we decided to make a delicious homemade crumble. We washed the apples and then the grown up peeled them. The grown ups then talked about being safe with knives and watched us while we chopped them up in to small pieces. Miss Kilner put the apples in a pan and while they cooked we made the crumble from scratch. We weighed and mixed flour, sugar and butter together, then we put it on top of the soft mushy apples. Then it went in the oven to bake. When the crumble was ready we all tried some, it was very yummy and there were lots of empty plates when we had finished. If you would like to make an apple crumble at home please click here to see the recipe. Today the F2 children have been fantastic at picking the apples and pears from our fruit trees outside. We have been talking about the shape, size and changes on some of the apples and pears. We have got lots of ideas on what we can do with our apples and pears. Watch this space! This week the children have been settling into full time school, learning boundaries, especially choose it, use it and put it away and making friends. The children have really enjoyed exploring different areas and getting know other children and all the grown ups. All of the grown ups have really enjoyed getting to know every child and their interests to learning. Please can all parents/carers make sure children's names are on every item of uniform. It is very easy for the children to pick the wrong cardigan, jumper or PE Kit up and not know any different. A big warm welcome to all of our children and parents/carers. We are all looking forward to supporting your children on their new learning journey this year. If you have any questions or worries please come and see us, we will be more than happy to help.